Eastlake Style Table Download a .pdf for a printout identifying design elements (html version) of this piece. In the last half of the nineteenth century, a reform movement spread through the United States. It changed the way many people thought about style and health in the home. People had filled their homes with large pieces of carved furniture, thick upholstery, and heavy draperies that collected dust and germs and kept out healthful air and light. The new simpler style began with an idea by a man who was an architect and arts writer, not a furniture maker. Charles Eastlake (1836-1906), an Englishman, wrote the book Hints on Household Taste in Furniture, Upholstery, and Other Details. He thought the objects in people's homes should be attractive and well made by workers who took pride in their hand work or machine work. As the book became popular in the United States, furniture manufacturers took ideas and designs from the book and made what was named Eastlake Style furniture. Pieces of furniture in this style had low relief carvings, moldings, incised lines, geometric ornaments, and flat surfaces that were easy to keep clean. 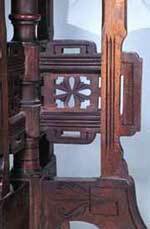 Also called Cottage Furniture, the mass-produced pieces were much more affordable than the fancy revival pieces.